COMING SOON: new collection to be uploaded in the near future! 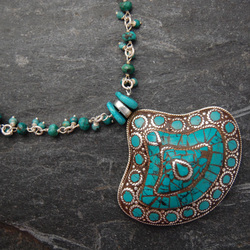 Handcrafted, one-of-a-kind artisan jewelry has been popular for centuries. Whether it was dressing for a formal dinner or taking a carriage ride in the park, a woman’s jewelry always spoke soft, subtle things about who she was and how she wanted to be seen by the world. And even though today we live in a more casual society, the tradition of jewelry as a means of self-expression lives on in women everywhere. Dee Antil doesn’t just make jewelry, she crafts it. Bead by bead, jewel by jewel, she pours her soul into every last piece. The end result is a one-of-a-kind work of art as unique as the woman who wears it. Made from the finest silver, highest-quality gemstones and kiln-fired lampwork beads from around the world, when you purchase a Dee Antil original you can rest assured that you have made an investment in heirloom-quality artisan jewelry that will stand the test of time. Dee uses a combination of time honored techniques such as wire wrapping, stringing and knotting. We hope you enjoy your visit to the exciting world of Dee Antil Designs, and that you will tell your friends about us. But more than anything, we hope that before you leave you’ll find one or more pieces of jewelry that speak to two very important people – the person the world knows you to be and that secret woman inside you. California Prop 65 Warning: We are committed to and recognize the importance of protecting the health and environment of our customers. While we use only sterling or fine silver in our designs, we also use Austrian crystal on occasion which contains lead, a chemical known to the State of California to cause cancer, birth defects and other harm if ingested. Crystal has unique properties. While made with lead, the crystal manufacturing process creates a matrix which greatly retards the mobility of lead. By contrast, lead in other materials such as unplated metal containing lead may be available for surface exposures. Swarovski believes that the use of their products poses no significant risk to human health. However, we recommend keeping all items away from children, not only because of the possibility of lead ingestion but because of the choking hazard.